Le Vian ONE DAY ONLY! One day only gift with purchase! Schedule a consultation with our jewelry consultants today! STOP BY MACY’S TODAY AND TRY THE LASTEST IN MATTRESS TECHNOLOGY! 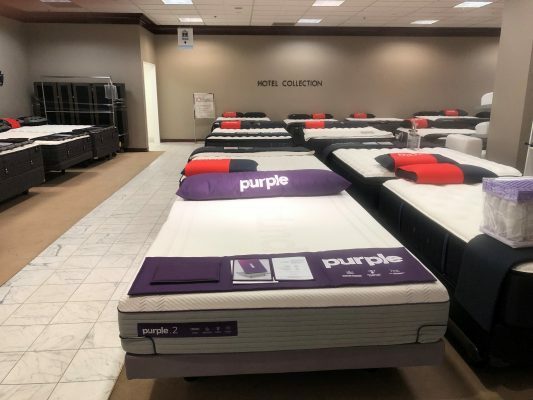 Everybody wants to know what makes the New Purple Mattress different from every other mattress out there. The answer is simple: our patented Smart Comfort Grid. It took years to perfect and has over 30 patents to its name. This unique top layer dynamically adapts to the human body and stays cool for superior, personalized comfort and better sleep. But we didn’t stop there. With the New Purple Mattress, you can now customize the thickness of the Smart Comfort Grid for progressive levels of comfort and support. That means a truly personalized comfort experience designed to give you the best night’s sleep possible. We’ve also added a new base layer comprised of individually wrapped responsive-support coils that further enhance the overall comfort, responsiveness, and durability of the mattress. The upside: You’ll feel so rested, you’ll wake up ready to make your wildest dreams come true. The downside: You’ll never want to leave your bed again.